I am not particularly nostalgic. However, the recent news that The Village Voice would cease print publication, and the Voice reunion that coincidentally came on the heels of that announcement, have me musing about the path my career has taken. In the mid-90s, I pestered my way into an internship at the Voice. While there, I saw the paper’s trim size shrink and its cover price evaporate. The reasons for the shift to an all-digital format may not be surprising, but watching the 62-year-old Voice lose yet another part of its journalistic self feels permanent and unsettling. To say that my time interning at — and eventually freelancing for — the paper was formative for me as a writer falls flat. To say it made me who I am today “for better or worse” is a Velveeta-laden overstatement (though it was the only thing I could think to write on my Facebook page). The Voice impacted me in ways I’m still working to understand. Much like the in-demand salon stylist with the bad dye job and split ends, or the smiling dentist with the lip-engulfing overbite, writers often exhibit remarkable tone deafness when it comes to illuminating their own characters. We relish delving into our interview subjects and article topics, while remaining blind to the subtleties and motivating factors that we either can’t — or won’t — examine in ourselves. While I don’t profess to know where precisely the line between detached investigation and insufferable navel-gazing lies, it likely resides somewhere between the heart and the gut. At the Voice I worked for investigative reporter Wayne Barrett. I heeded warnings about unreasonable demands, outbursts, long hours — all for no pay. I would come to realize that while Wayne’s legendary temperament may not have been overstated, his dedication to those of us who trained under him was definitely underplayed. Wayne never wavered in his support of me when I wandered from city beat to feature topics and sports. He was more bemused than judgmental about my hit-and-miss forays into television. The Girls of Atomic City, a journalistic nonfiction book I wrote about young women and men working unknowingly on the first atomic bombs, struck a chord with him, the son of a nuclear physicist. The notes he sent following its success still buoy me as I wait anxiously for my latest book, The Last Castle, to be released this month. Embrace that crappy first draft…but not too tightly. Common writing advice is to write a crappy first draft, get to the end, then revise. However, if you look for feedback before revising, be prepared for people to tell you it’s crappy — especially at a newspaper. But you knew that anyway, right? Know when to share and with whom, and then sit back and take the lumps you ordered. Don’t stop until you feel yourself walking that line between “I can’t do this” and “I’ll show them.” Then get back in your chair. Consult people you don’t like. Read books, magazines, and articles that fly in the face of everything you hold dear and that make your skin crawl. Whether journalism or books, fiction or nonfiction, get inside the head of those with whom you disagree. You can go back to not liking them after you’re done writing. The bookends of my interning days with Wayne were the morning task list and the end-of-day memo. The nonchalant ticking off of items was a quick trip to vociferous public scolding, and woe betide the intern whose memo of deeds done fell short of the to-dos assigned. Persistence counted in one’s favor, but reports of a failed attempt to reach a source could never be left at “I couldn’t reach them.” Oh no. “Pick up the phone” could stand as its own entry. Email makes everyone seem accessible every hour of the day, but that access is elusive. Calling someone carries much more weight today and genuinely surprises some people. If you really want to freak them out, stop by someone’s place of employment for an actual face-to-face meeting. So my advice to up-and-coming writers, for whatever it's worth, is to spend some time working in a newsroom. Don’t take anything personally, but take everything it can throw at you. I marveled at how Wayne knew everyone, their assistants, where they worked last, and where they were headed next. His deep knowledge resulted from working the same beat for years, but he also strove to stay abreast of everything that was going on in the world of city politics that he covered. If you’re an author, that means staying on top of developments in the publishing industry. A news feed is one way to do this, but personal interaction gets more traction. Make an effort to make a connection. Remember, you might even be able to help someone else. Give and take, ebb and flow. Don’t get too chummy with the people you’re covering, whether you’re a book writer or a journalist and whether that subject is living or dead. Getting an inside scoop does not necessarily mean becoming best buds and, more importantly, that kind of closeness can erode any chance you have of maintaining some level of objectivity. Also, while relationships with editors and publishers can be vital to your career, people move on. Wish them well, stay in touch, and make a new connection. Whether a journalist with a juicy lead or a fiction writer with the perfect plot twist, there is a time and a place to let your work-in-progress out into the world. Don’t send it out too early and don’t let it hang with the wrong crowd. Ideas get stolen before they’re developed. Work gets torn down before you’ve had a chance to build up its defenses. Find those who will criticize clearly and with compassion, or at least with a matter-of-fact veneer of professionalism. Don’t be too precious about your work. There is nothing like a newspaper deadline to train you to murder your darlings. Time constraints mean that even the most well-intentioned editor simply does not have an extra 10 minutes to explain why something isn’t working. They are surgical, brutal, and blunt. If you allow them to be, these moments can be some of the most enlightening of your painfully inept writing life. While the correlation between 21st-century FOIA requests and 19th-century embossed stationery may seem tenuous, both can help flesh out the who, what, where, when, and why of a story. In a time when the Library of Congress is attempting to archive tweets, I remain charmed by letter writing. I love sitting in a room lined with books, next to a rolling cart of archival boxes stuffed with letters, diaries, and photographs. An individual’s handwriting, once you get to know it, speaks volumes about their state of mind (and sometimes sobriety). As hipster chic successfully revives interest in tiny ice cube hatchets at the newest pseudo-speakeasy, a return to the corner barbershop, and creates legions of printing press aficionados, I am hopeful that the art of letter writing shall endure. Whatever form it takes — email or snail — follow the paper trail. Let the story lead you — don’t tell it where to go. The idea is so clear. You know exactly how you want the work to turn out. You create the perfect quotes, holding them in your mind, as if you can silently will the people you are interviewing to spit them right back at you. No matter what your aim is when you start out, remain open: open to unexpected information, open to changing viewpoints, open to the possibility that this story isn’t as great as you thought it might be. Dig, research, and go in uncharted directions. Don’t let preconceived notions or ego hold the story back if it needs to take a different course. Pay attention and take notes. Save your clips, but don’t rest on your laurels. Keep working. Each completed work — poem, essay, news article, or book — is an accomplishment. Savor that…for a bit. Then get going. Nothing makes a piece of creative work feel as if your entire career depends on it more than the lack of other work. Dilute expectations by spreading out your work energy. Give yourself a rest if need be, but shift into action on new work rather than stagnate while reflecting on the old. One of the last conversations I had with Wayne was about book ideas. I was debating a few and he was characteristically frank about what he liked. I keep my own counsel, but if I listened to anyone else's, it was his. So my advice to up-and-coming writers, for whatever it's worth, is to spend some time working in a newsroom. Don’t take anything personally, but take everything it can throw at you. Denise Kiernan has been working as a writer for more than 20 years. Her work has been published in The New York Times, Wall Street Journal, The Village Voice, Ms. Magazine, Reader's Digest, Discover, and many more publications. She has also worked in television, serving as head writer for ABC's Who Wants to Be a Millionaire during its Emmy Award-winning first season and has produced for media outlets such as ESPN and MSNBC. She has coauthored several popular history titles including Signing Their Lives Away, Signing Their Rights Away, and Stuff Every American Should Know. 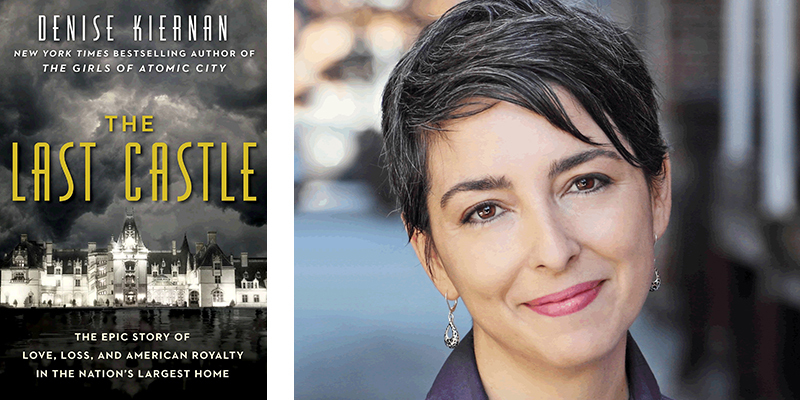 Her last book, The Girls of Atomic City, is a New York Times, Los Angeles Times and NPR bestseller, and was named as one of Amazon's “Top 100 Best Books of 2013.” It was awarded the 2014 Woodrow Wilson Foundation Award for the best book published in the United States on government, politics, or international affairs. Throughout her career, Kiernan has been a featured guest on many national radio and television programs, including NPR's Weekend Edition, PBS NewsHour, MSNBC'S Morning Joe, and The Daily Show with Jon Stewart. The Last Castle is her most recent work.